In summer 2014, our screens were inundated with videos of the carnage from the streets of Gaza. The European media was outraged, and the sense of moral urgency was amplified across social media. Similar outrage greeted the destruction of UNESCO heritage sites in both Iraq and Syria with the condemnation of Islamic State’s barbarism reaching a crescendo when it overtook Syria’s majestic city of Palmyra. Compare this coverage to the almost universal silence on the ongoing war in Yemen, which is largely absent from our TV screens, Facebook and Twitter trending topics sections and the front pages of broadsheet papers. Admittedly, the Yemen conflict is a complicated matter, where the Saudi “bad guys” in the northern half of the country are looked upon as potential saviours in the southern half. The war includes a number of factions, and provides no easy narratives for the casual news watcher to follow. Of course, neither the Israeli-Palestinian conflict nor the Islamic State’s onslaught are simple matters, but the Western media has plenty of simplified narratives and stereotypes at its disposal to structure its coverage. And crucially, the media coverage of both Israel-Palestine and Islamic State is loud and clear in its condemnation of the human cost, both civilian and cultural. So it may come as a surprise to learn the the damage inflicted upon Yemen and Yemenis since March 2015, when the Houthi rebels’ march toward Aden was met with a massive Saudi-led offensive, has already claimed more casualties than the last Israeli offensive in Gaza and has destroyed parts of a UNESCO World Heritage Site. Worse yet, it shows no signs of stopping. Comparing human suffering by numbers is always a risky game, since such comparisons are easily used to advance propaganda. But in this case, there’s a real point to be made: our silence on Yemen is a serious political failure – and a look at the scale of the conflict should force us to ask difficult questions about its root causes and consequences. This is not some brief flare-up. While the Israeli offensive against Gaza lasted a bit over a month, the Saudi offensive on Houthi targets in Yemen has lasted for more than three months. In that time, the Saudi-led coalition has bombed roads, houses, and electricity and water supply lines; it has flattened a whole city — the Houthi stronghold of Saada. At the same time, the Houthis have continued their march to the south, committing atrocities against civilians along the way. Meanwhile, according to the World Health Organisation, civilian casualties reached 2,584 by June 7, while those wounded numbered 11,065. More recent reporting from the BBC puts casualties at 2,800. This more than matches the Gaza conflict, where the death toll reportedly reached 2,191 and the wounded numbered 10,895. Several reports have emerged from human rights organisations pointing to consistent violations of international law in Yemen: the use of US-manufactured cluster bombs by the Saudis, the indiscriminate shelling of Saada, vengeful and punitive attacks against civilians and their properties in Aden by the Houthis, and the use of child soldiers. The BBC is reporting that hospitals in the country are unable to cope since they lack medicines, while life has more or less stopped in the absence of electricity and water – this as the Saudi blockade of the country has driven prices up by at least 400%. Finally, clumsy Saudi strikes have already struck Sanaa’s old city, an architecturally unique UNESCO heritage site that has been inhabited for more than 2,500 years and which is culturally significant not only for Yemenis, but for Muslims around the world. These awful figures can only convey a glimpse of the suffering endured by Yemenis on a daily basis. The point of bringing them all together, as argued above, is to highlight the relative silence that has greeted this war as compared to other, similar conflicts. Perhaps this is a factor of the distance between Yemen and the West, both real and imaginative. Yemen is further away from Europe than Gaza in both senses, and “we” simply know far less about it. More importantly, reporting on Yemen has so far been based on the false identification of the state and its citizens with “uncivilized” tribes and angry, al-Qaeda-affiliated Muslims. 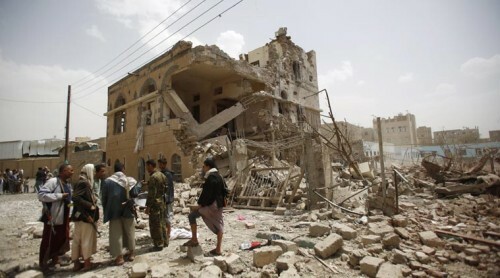 Most stories about Yemen up to the beginning of the war revolved around terrorism and drone strikes. As a result, the lives of Yemenis have perhaps slipped down the the “scale of innocence” on which we grade others and their suffering. The practicalities are significant too, of course. Far fewer reporters from Western news outlets seem to be on the ground in Yemen in comparison to the war in Gaza, with few high-profile and recognizable faces making the journey to report on what’s happening. This is thankfully changing with the arrival of the BBC’s Jeremy Bowen, Lina Sinjab, and Orla Guerin in Sanaa and Aden in recent weeks. Then there’s the matter of geopolitics. This war is simply less of a crisis for Western governments than the Islamic State offensive and the Israeli-Palestinian conflict – but it’s hardly insignificant. It involves one of the US’s most important allies in the region and one of the world’s most important suppliers of oil. The most decisive political difference here is that whereas Gaza and the plight of the Palestinians have been adopted as a cause célèbre by the European (and to an extent, American) left, Yemen has largely been ignored. In the absence of a similar engagement from leftist politics, reporting on Yemen will remain sparse, and will never stir enough outrage to affect the course of events. Given the sheer volume of grim news coming out of the Middle East, addressing this disparity is a huge and near-impossible task – and those on the ground and their loved ones, near and far, will remain largely off the world’s radar.